Note: Since there may be people who are trying to learn the Portuguese variant of Portuguese, I've included the tu form in this guide. The subjunctive (O subjuntivo) can be tricky to grasp for English speakers, as it's rare in our language. I'm putting this guide together in the hopes that it will help those who struggle with this aspect of Portuguese. The subjunctive is a verb mood. What does that mean? A verb mood, of which there are four, shows the meaning behind a verb, not the time at which it occurred - the subjunctive ≠ a tense. The four verb moods which exist are the indicative, the conditional, the subjunctive, and the jussive. The indicative is the easier form which is learnt first - used for things like facts or definite situations, like “He was here”. The conditional is used for situations which are dependent on other situations to be able to occur, like “I would go, if I had the time“. The jussive is the form used for the “Let's ...“ and imperative forms of the verb, like “Let's eat” and “Eat!”. The subjunctive, however, is used in situations of doubt, desire, opinion, and others, which will be shown later. The use of the present subjunctive can be hard to get the hang of at first, as it appears so seldom in English (an example being “I suggest that he go“). If you've already encountered the subjunctive in other languages like Spanish, it will be a bit easier, as many of the “subjunctive phrases” will carry over to Portuguese. Likewise, getting familiar with the subjunctive in Portuguese first will help when it comes to using it in other languages. If there is doubt within a situation, the subjunctive is used. For example, phrases like “Não acredito que...“ (I don't believe that...), “Duvido que...“ (I doubt that...), “Não estou seguro de que...“ (I'm not sure that...) all use the subjunctive. The use and wording of phrases will depend on the region that you’re in. 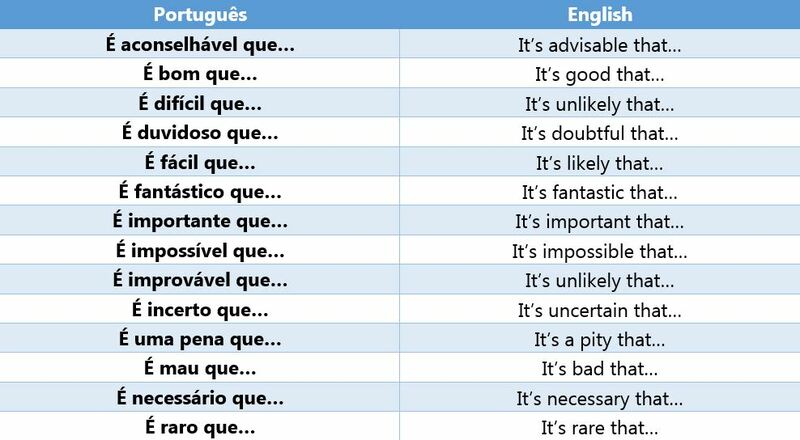 Remember that any phrases where there isn't doubt don't use the subjunctive, for example “Acho que...“ (I think that...) and “Não duvido que...“ (I don't doubt that...). Let's look at some example sentences - words in Italics are “subjunctive phrases“, and words in Bold are verbs in the subjunctive. Não fales assim! - Do not speak like that! Aprendam comigo! - Learn with me! Tomara seja bom! - Let's hope it's good! Que nunca partamos! - Let's never leave! Se você não tivesse de trabalhar, o que você faria? - If you didn't have to work, what would you do? Como se apenas eu gostasse daquilo! - As if it were only I who liked it! The future subjunctive is used to talk about future events with uncertainty. In most other languages, either the future indicative or present subjunctive is used in these cases. The first sentence is referring to the future, whereas the second is referring to the present. I hope this helps!/Espero que isto ajude! Check out my other subjunctive guides! I would like to suggest a few adjustments for this excellent post. Its very good to have people who wish to help and bring such a detailed guide to us. There may be a difference between Portugal and Brazil here, I can only speak for Brazil, though. In Brazilian Portuguese, we don't know the expression "à vez", we use "de uma vez (só)" instead. In the first one, using the indicative is assuming and accepting he actually learns 10 languages. Ex: Someone tries to convince you, and you actually accept that as true. Using the subjunctive is to believe he probably does. Although having the same form, imperative conjugations shall not be seen as subjunctive conjugations. But you can use it as a very good trick to remember. In Brazil, we don't understand the expression "Que não os entenda?" From were it says "How the imperfect subjunctive is used" for me it gets confusing. Not all of those sentences are in the subjunctive, but some are. The intention is to correct the original post and compare what changes in meaning when you use the subjunctive. I listed the possible sentences and their different meanings. Must you use the imperfect subjunctive to talk about imaginary things in the past? There are keywords and keyverbs that ask for the subjunctive. Also, conditional sentences and a few other constructions. It tends to be about "hypothetical" cases, but not strictly. The imperfect subjunctive can be used either in past cases or in hipothetical conditionals. The past subjunctive talks about actions in the past that are uncertain and also about hypothetical things in general. The conditions for using the past subjunctive are very similar to those for using the present subjunctive. There is just a difference in tenses. But here, a very important case comes into play: the conditionals! One of the most important usages of the past subjunctive is for creating conditionals. You will notice also that the "if" keyword (se) is present in conjugation tables. Eu acharia você, nem que eu precisasse dar a volta ao mundo = I would find you, even if I needed to circle the world around. If you're not picky, you can let the difference pass unnoticed. With "que": it expresses more like a wish, it may sound somehow like a command. It can sound close to "You'd better survive", although the present tense (É bom que vocês sobrevivam) is the most suitable for that command-like sentence. Another possibility is "It would be good for you to survive". With "se": it expresses that I'd like the result if you happen to survive. It gives more chance and less importance to the case of not surviving. Do these two sentences mean exactly the same thing? : "Seria bom que vocês sobrevivessem." / "Seria bom se vocês sobrevivessem." But I have still a doubt: is it perfectly impossible to say "é bom que eles sobreviveram", taking into account that "it is already clear that they did survive"? Oxalá is not use nowadays in brazil. people use "tomara". You find oxalá in literature and old texts. In Brazil people can confuse oxalá (wish) with Oxalá ( God from candomblé religion ). Amazing job! There goes a lingot! But then the examples take the infinitive as a base. Portuguese is the only Romance language to still have the future subjunctive active. The future subjunctive is not used in the day to day language in Spanish, but it can be found in famous bible verses, in literature, in the legal realm and some popular expressions. As a native Spanish speaker I find useful to compare the Spanish future subjunctive with its equivalent in Portuguese. ⇒ Yes, the verb in the subjunctive uses the past tense, but the “impersonal statements“ are in the present tense. ⇒ Notice the word “active“. Yes, Spanish has the future subjunctive, but it's not really used on a day-to-day basis, is it? Whereas in Portuguese, it is. For example, in my phone's settings, it says “Se não estiverem redes conhecidas disponíveis, terá de selecionar uma rede manualmente“. If my phone were in Spanish, you wouldn't (and don't) see the future subjunctive anywhere in the settings app. I see where I was wrong. Thank you, it's clearer now. Yes, Spanish has the future subjunctive, but it's not really used on a day-to-day basis, is it? Whereas in Portuguese, it is. It's not used on a daily basis, it's true. I just wanted to point that it is known, and still used in some contexts, in Spanish. É bom que vocês sobrevivessem. The present perfect subjunctive describes a possible completed action in the past and is triggered by a present tense verb in the main clause. É bom que vocês tenham sobrevivido. = It's good that you've survived. Não acredito que ele tenha partido sem dizer "Tchau." = I don't believe that he's left without saying "Goodbye". As a native speaker (Brazilian), I'd be ok with the second example if it had a different translation, but I wouldn't agree with the first. Não acredito que ele partisse sem dizer tchau = I don't believe he would leave without saying goodbye. Seria/Era bom que vocês sobrevivessem = It would be good if you were to stay alive. Eu pensei que ela tivesse usado todo o dinheiro. I thought she had used all the money. Yo pensé que ella hubiese usado todo el dinero. Why use the subjunctive when a past tense of the indicative is enough? Yo pensé que ella había usado todo el dinero. Thanks a lot, very helpful ! subjunctive is the hardest thing for me in romance languages. why does the "I think that" not express doubt? also how come in the imperfective subjunctive it says -êssemos for nós endings but tivéssemos has é and not ê? Colher (to collect / harvest) sounds like "ê"
Colher (spoon) sounds like "é"
Força (force/strength) sounds like "ô"
Força (he/she/it forces) sounds like "ó"
But remember that "ter" is irregular, and its conjugation is not "têssemos". The irregular form "tiver" sounds like "é", and thus the "we" form will use "é": tivéssemos. "é" sounds like "yElling", "hAir" (American). As I said before, just the letter "e" is not enough to tell you which pronunciation it takes. (See the "colher" example, for instance). Accents themselves are not often used to change pronunciation (except for a very few words: "céu", "chapéu", "avô", "avó"...). They're used to change the "stressed syllable". "É" and "ê" will be chosen word by word, no clear rule for them, unless the accent is actually present on the word. The "en" pronunciation is pretty much the American "en" in "Enter" or "cAn". It happens whenever "e" is followed by "m" or "n", overriding the accents if they are there. (Words like "alguém", "também", "entre", "êmbolo", "prêmio", "premio", "Emerson"). This is called a nasal sound. (In European Portuguese, they are less nasal and more independent from the "m/n"). And it also appears (apparently randomly) in the middle of certain words, most of the times optionally. Classic examples are words with "des" prefix, like "desfazer" (disfazêr), "desculpe" (disculpi). Some other examples are "perigo" (pirigu), "ensinar" (insinar). The "in" happens when "e" shifts to "i" and there is "n" or "m" after it. And also in words with tildes: "mãe" sounds like "m-an-in". In English, it would be somewhere near "mung-ing". (Discarding the "g" at the middle). Amazing article! Just a small adjustment. The verb "haver" is never conjugated. It only exists in the third person. So "tu hajas" doesn't exist in modern Portuguese. This verb only exists in its impersonal forms, so in subjunctive mood, we may only find "haja": Eu quero que haja mais dias de férias. (I want that there are more vacation days). After studying Portuguese for over 4 years and being in Brasil 14 times I don’t understand this at all and it terrifies me. Verbs are difficult enough for me so adding more difficult concepts make learning it seem impossible to me. I still can’t understand how people can learn Portuguese with the struggle I have learning it. Thanks though. I appreciate your work.